25-year-old Danny Gonen was murdered when a terrorist opened fire on him and his friend. "He was the best boy in the world," says his uncle. The man who was killed in Friday’s shooting attack near the town of Dolev in the Binyamin region has been named as 25-year-old Danny Gonen from the city of Lod. Gonen’s friend was wounded in the attack and is hospitalized at the Tel Hashomer Hospital in light to moderate condition. Gonen’s uncle, speaking to the Walla! news website on Friday, said that Danny and his friend had been shot during a hike in the area, something they had done often. "Danny was visiting the area with a friend, as he always did. He liked to hike everywhere in Israel," said the uncle. "Danny was the best boy in the world,” he added. "He was an electrical engineering student who loved to hike a lot. He was the eldest son and is survived by his mother and four brothers." 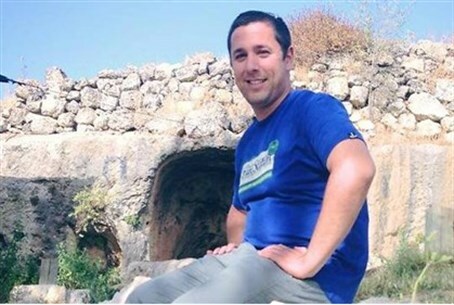 According to investigators, the two victims were finishing a trip to a nearby spring and had begun leaving when a Palestinian Arab standing at the side of the road waved them down, apparently asking for help. As soon as the Israelis' car pulled up he asked them for water, and then shot them at point-blank range and fled the scene. MK Motti Yogev (Jewish Home), a resident of Dolev and Colonel in the IDF reserves, arrived at the site of the attack shortly after to help emergency services evacuate the victims and secure the area. According to a statement from the Magen David Adom (MDA) emergency service, "At 16:15 MDA's Jerusalem branch received a report of gunfire towards a vehicle traveling on a dirt road close to Haparsah Junction, close to Ein Bubiv, close to the community of Dolev in Binyamin." MDA paramedics treated a number of casualties at the scene, including one "unconscious, and in serious condition," and another suffering from moderate wounds to his limbs.